What is a ‘joint surface problem’? itself, or some of the underlying bone. joint surface, osteochondritis dissecans (OCD), later in this section. this page, call Yorkshire Knee Clinic. You can damage the cartilage in your knee joint in a variety of ways. You might jar or twist the knee, or the injury may occur in conjunction with a meniscus ligament injury. 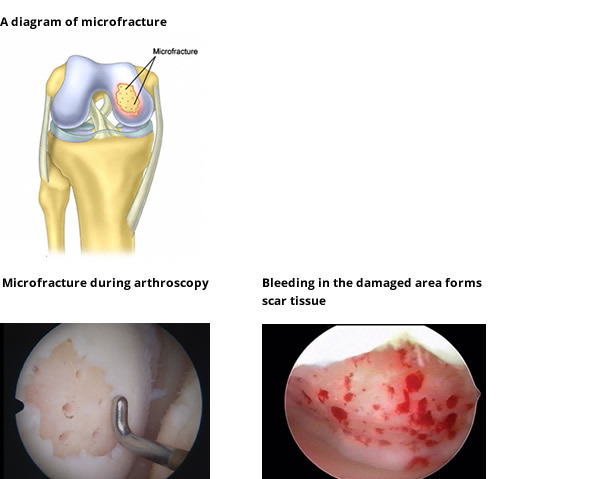 The injury may result in a loose fragment of cartilage leaving an exposed area of bone in the knee (a crater in the otherwise smooth joint surface). Alternatively the damage may be a breaking up or splitting, but not complete loss of, the cartilage. In younger patients, this sort of knee injury typically results from a clear impact injury. As we get older the cartilage becomes more degenerate and fragile, so injuries occur more easily (similarly for tears of the meniscus cartilage). In these cases there seems to be an overlap with the early beginnings of osteoarthritis. Joint surface injury can be a potentially troublesome condition, particularly in young adults, because it may give rise to long term problems. Articular cartilage tends not to heal well, and if the meniscus is also torn, the prognosis is worse. It can be difficult to treat, and can increase the risk of developing significant osteoarthritis. There are, however, a number of options your knee consultant may be able to recommend. If you have a joint surface problem you may feel pain, clicking, catching and swelling. Sometimes you may feel your knee ‘lock’. Often, the affected area may feel painful, but sometimes you may find it difficult to say exactly where the pain is arising from, and the knee feels generally uncomfortable. If the injury has resulted in a fragment of the joint surface cartilage floating around the knee you may also feel a ‘clunking’ or catching sensation. Your Yorkshire Knee Clinic orthopaedic consultant may need nothing more than the story of your injury and an examination of your knee to diagnose chondral cartilage damage. A bigger injury, where a piece of cartilage and bone has come off, is called an osteochondral fracture. This may cause severe pain and swelling and we may use X-rays to identify the small fragments of bone or cartilage. Alternatively, you knee consultant may recommend an MRI scan. These will reveal most join surface injuries, but can miss smaller ones. If your knee specialist suspects such an injury but x-rays and the MRI scan prove negative, we may recommend keyhole (arthroscopic) surgery to diagnose and treat the problem. Treatment of joint surface problems depends on the size, site and depth of the damaged area. Small areas of damage in older patients are not uncommon, and can often settle over 6-8 weeks with rest and anti-inflammatory tablets. You may, however, find background problems of aching and swelling persist. Many acute knee cartilage injuries need keyhole surgery to either remove or repair the damaged fragment. In general, the only repairable injuries are where there is quite a large chunk of a cartilage, preferably with a sliver of bone attached, which can be pinned back in place. In these cases, there is a good chance of healing. Where the fragment has to be removed, or where you first visit Yorkshire Knee Clinic long after the injury occurred, you may experience pain due to the loss of normal cartilage covering. The missing cartilage could result in a crater in an important part of the knee, with bare bone in the base. It will not heal up with normal joint surface cartilage. It may heal with fibrocartilage or scar tissue but even here, there can still be problems, in which case you may need one of the following types of knee surgery. In a “microfracture” procedure, your knee surgeon makes some small holes in the bone. By encouraging bleeding from the bone in the damaged area, a fibrocartilage covering forms. Fibrocartilage is a strong, durable type of cartilage which, whilst not as good as the original articular cartilage, is very effective at doing the same job. Microfracture is a very useful and simple technique, and at Yorkshire Knee Clinic the procedure can be done as day case keyhole surgery. Depending on the size and site of the microfracture area, you might need crutches for up to six weeks. OATS, also called mosaicplasty, is a technique where we take some healthy plugs (cylinders) of bone and articular cartilage from one area of the knee (where it is required less) and put them into the damaged area. It can be effective in the treatment of some defects, especially when they are deep and include bone loss, but typically only in small areas of damage. 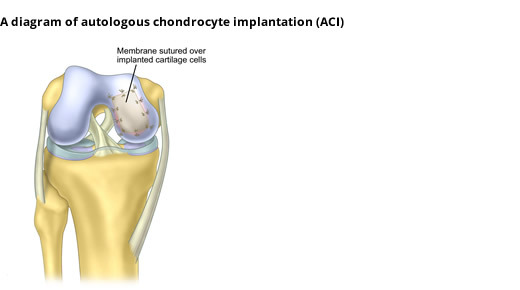 ACI involves your knee surgeon removing chondral cartilage cells from your knee, creating a culture from them, then reinserting the newly grown cells into the affected area in a second operation. To date, however, results of this procedure have been no better than in microfracture, whilst requiring two operations and greater expense. What next in joint surface injury? 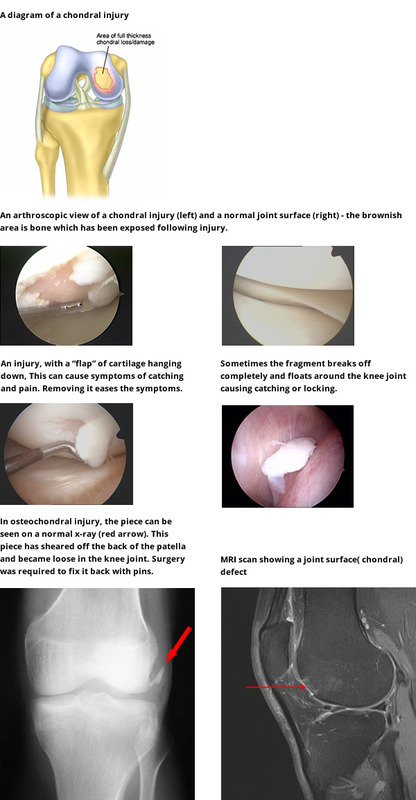 There is an enormous amount of research going on into treating the damaged joint surface. There is currently no perfect treatment for joint surface injuries, or degenerate damage, and with current technology it is not possible to reliably re-create the normal articular surface. Stem cells are unspecialised (undifferentiated) cells, which can develop into other cells or tissues. MSCs (mesenchymal stem cells) are stem cells which eventually form cartilage. Much effort is being put into this area, and might be something for the future. Yorkshire Knee Clinic surgeons are actively involved in this research. OCD is a condition that affects the knee, as well as other joints. A small piece of bone separates from the joint surface and causes pain and swelling. Sometimes the piece can fall out into the knee, leading to sharp pains and locking or trapping. The condition is most frequent among 10-15 year olds (when it is called juvenile OCD) but it can occur at any age. It is a little more common in boys. The exact cause is not known, but may be related to doing a lot of sport. A temporary interruption of the blood supply to a section of the bone may be responsible. In some cases inherited factors may play a part. Initially, you will probably find your knee consultant recommends treating juvenile OCD by reducing activity and sport, especially those involving repetitive impact, twisting and jumping. If this fails to resolve the problem you may need surgery. This might entail keyhole surgery to encourage the loose fragment to heal. Sometimes, your Yorkshire Knee Clinic surgeon may fix the loose piece back with pins or small screws. If it develops into a loose body in the knee, the piece will have to be removed. The long term effects of having OCD of the knee are variable. Depending on age of onset, size of the OCD, and compliance with treatment, it may be something which can result in a fairly normal knee, or can cause more disabling problems in the long term. Unfortunately it is often difficult to predict which way any particular case will go. If you are experiencing knee pain, swelling or locking, talk to an orthopaedic consultant at Yorkshire Knee Clinic. To book an appointment, please contact us.